Luckily she gained momentum – and I hadn’t unlearned sewing as well. But before I am going to approach Anna’s Caravan Tote – pattern already bought ages ago, the cut pieces laying around for weeks, but couldn’t find time to order leather handles – I sewed this little wristlet pouch for me. 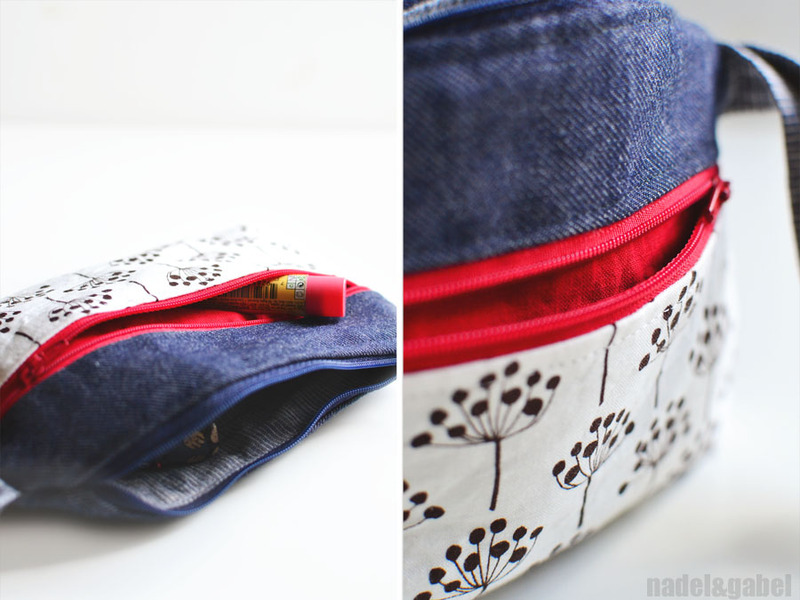 Keys, smart phone, lip balm, tissues – everything is kept in this one small pouch aka clutch. 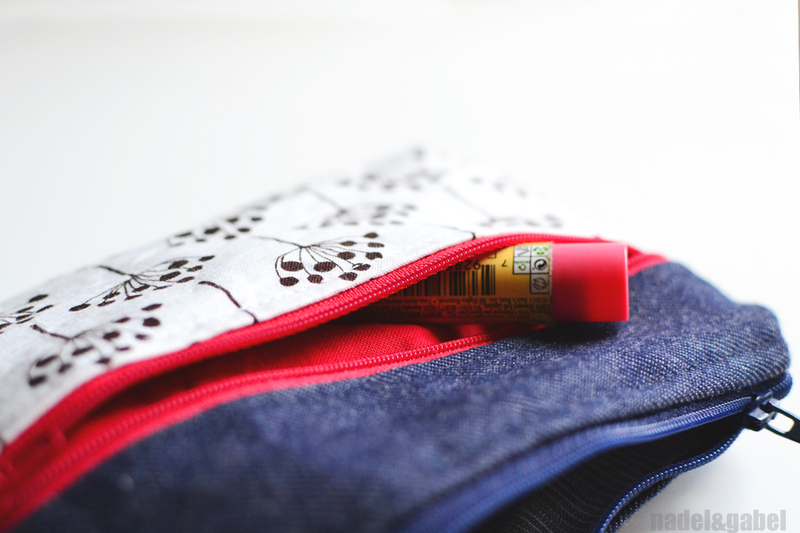 The basis is a simple retangular pouch … with a little extra: a front pocket that is closed by a second zipper. 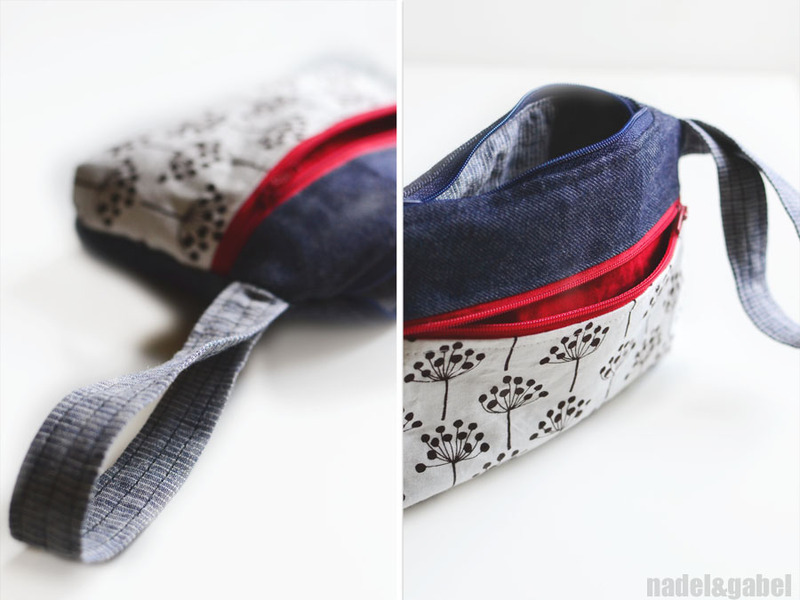 I saw different tutorials for such pouches, but they all seamed so difficult and did confuse me more than they helped me. So I decided to start my own trial and error … in the end there wasn’t in fact a lot of error, apart from the two zippers opening in different directions. I always forget about those things! -> I rounded the bottom of all pieces and also added small darts for some depth. Cut all pieces, fuse interfacing to exterior front pocket, main pouch exterior and one of the main pouch linings. Sew together all darts. Sew the two front pocket pieces to one side of one of the zippers, the two small stripes to the other side, wrong sides facing (I find this still the most understandable tutorial for sewing zippers). If you like to, topstich along the zipper (I always topstich through both layers.). Check if the length of the whole piece is the same as the big lining/exterior pieces. If not, adjust. Now it’s time to sew all pieces to the second zipper. You may want to add some basting stiches to make sure that all layers stay in place. Start with the first side of the zipper: align the zippered front piece and the pocket lining on the top side of the zipper, the interfaced lining (main pouch) on the other side, right sides facing with the zippered front piece. Take your time to assemble the pieces the right way! On the other side sew the remaining pieces to the zipper, again right sides facing. Again, add topstiches if you like. Now, pin exterior pieces right sides together and interior pieces right sides together. Squeeze in handle at the intended place between the two exterior pieces (depending on whether you’re left or right handed). The ends should stick out about 1 cm. Be sure to slide open your zipper. Sew all around the edge leaving a opening in the lining for turning. 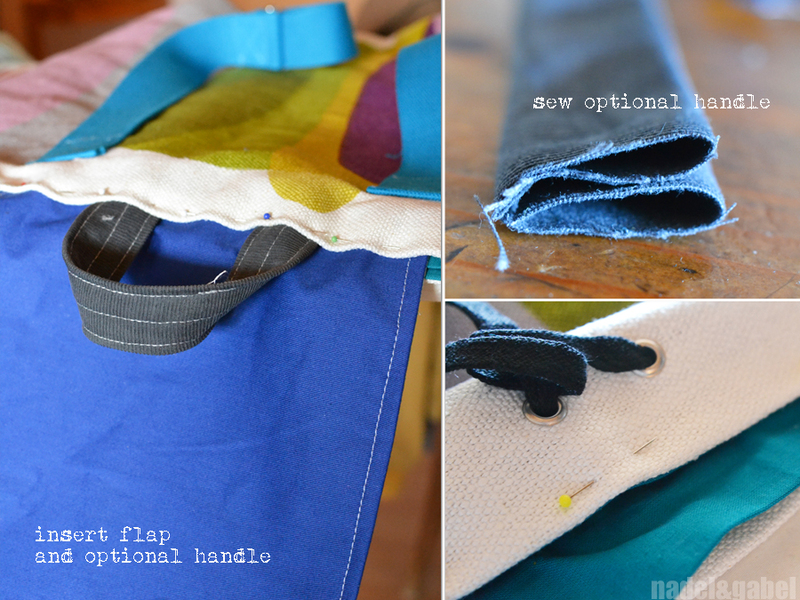 Clip corners, trim edges and turn pouch right side through opening and close opening.